Internet accessibility, technologies that permit the user-generated media, and social media allow for unlimited potential for learner choice and voice. Giving learners choice in how they want to learn content including through videos, text-based resources, podcasts, hands-on modules, or human interactions (see UDL’s multiple means of representation). Giving learners choices to show what they know-what they learned through anything from writing a paper to creating a multimedia presentation to creating a performance art work (see UDL’s multiple means of action and expression). Giving learners choice to study topics based on personal interests (see Interest Fuels Effortless Engagement). Being a tour guide of learning possibilities – showing learners the possibilities and then get out of the way (see https://usergeneratededucation.wordpress.com/2015/07/26/show-learners-the-possibilities-and-then-get-out-of-the-way/). Giving learners an opportunity to use their unique voices to show what they know-what they learned (see UDL’s multiple means of action and expression). 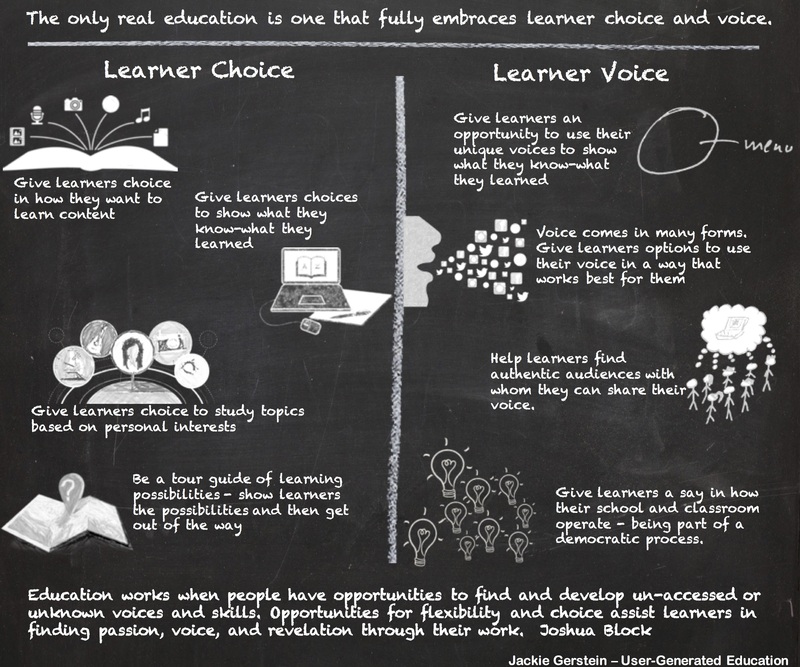 Giving learners options to use their voice in a way that works best for them. Some may want to write, some may want to use art, photos, videos, and others may want to talk. Helping learners find authentic audiences with whom they can share their voice. Giving learners a say in how their school and classroom operate – being part of a democratic process. The essence of the demand for freedom is the need of conditions which will enable an individual to make his own special contribution to a group interest, and to partake of its activities in such ways that social guidance shall be a matter of his own mental attitude, and not a mere authoritative dictation of his acts. Thanks for this post with resources, Jackie! I’m passing it on to preservice teachers. I am a secondary school Science teacher in New Zealand and I am studying towards my Masters in Education. You’re blog is wonderful, I have enjoyed reading parts of it. I am messaging to ask if I could possibly use one of your infographs for an assignment of mine? If not that is of course fine, I am struggling to find good ones on the growth mindset. All my work is creative commons – share with attribution, so do for it!